The Flathead National Forest is pleased to announce the arrival of two new Rangers; Bill Mulholland and Chris Dowling. After the retirement of Ranger Rich Kehr, from the Swan Lake District, and a promotion to a Forest Supervisor in Wyoming for Ranger Lisa Timchak from the Tally Lake District, there have been exceptional acting Rangers in place while the hiring process was underway to fill the positions permanently. Bill started his Forest Service career on the White River National Forest as a timber seasonal in 1990. During that time he completed his Undergraduate Degree at Northern Arizona University in Environmental Science and his Master’s in Environmental Management from the University of Denver. Bill was also simultaneously serving in the U.S. Army Reserve and was deployed to Operation Desert Storm in 1991. After completing his education he spent over two years in Washington DC as an Environmental Analyst working for a fast paced private consulting firm and couldn’t wait to get back to the Forest Service. In 1998, he returned to the Forest Service in Colorado working in Recreation and Lands. He was the Leadville Ranger District’s Recreation, Wilderness, and Lands Staff Officer for over 12 years. In 2014 Bill accepted the District Ranger position on the North Umpqua Ranger District in Oregon. This District encompassed large vegetation management and fire programs. He will be joining the Flathead National Forest with his wife and two young children. Chris comes to the Flathead National Forest joined by his wife Tanya and 4 children. Chris brings over 23 years of forestry and natural resource management experience, and has earned several college degrees, including a Masters in Forest Management from Oregon State University in 2003. 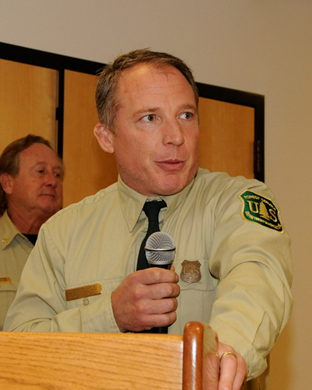 In his 14 years with the Forest Service, Chris has worked as a Presale Forester, District Silviculturist, Forest Silviculturist and Timber Program Manager, and most recently, the District Ranger on the Palomar Ranger District on the Cleveland National Forest. Chris has worked on National Forests across the country from Wrangell, Alaska to San Diego, California. “I am very excited and grateful to have the opportunity to be a part of the Swan Lake Ranger District team,” stated Dowling, “I am looking forward to working together toward investing in our workforce environment and building productive district capacity through partnerships & volunteer opportunities in an effort to further the agency mission and provide for top notch customer service”.